I am making this super quick as I have a bunch of exciting posts this week - so this one will be short and sweet! 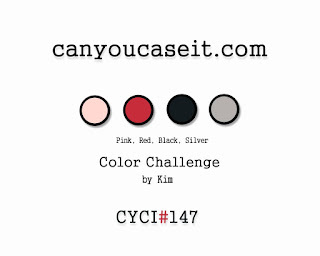 This week over at Can You Case It we have a great color challenge for you! I used a sentiment and image from Unity Stamps for this quick card! 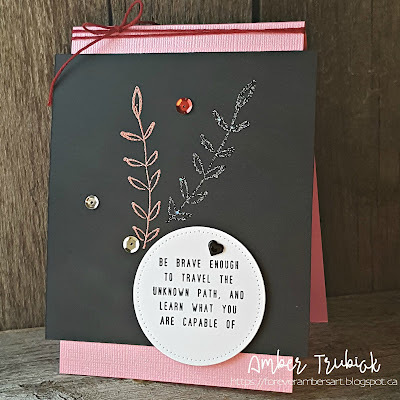 I heat embossed with both silver and pink - and added a couple simple little sequins! Please play along with us over on our FB challenge page! Thanks for stopping by! Leave some love in the comments below! Stress can be a good motivator. Lol Great job! Love the simplicity of it, its stunning! Great UNITY card with an early set. Just a gorgeous card. The simplicity is beautiful! Fantastic design, Amber! I love that layer that goes off the edges... really makes the design pop! Love it!